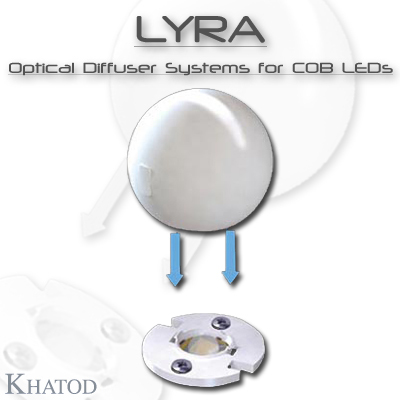 The Optic Lenses for Power LEDs available for all major LEDs manufacturers. Developed by using also NJC™ Technology which removes the need for lens housing. The optics are available in Single Lenses, Triple Lenses, Quad Lenses, Multi Lenses, Strip Lenses, Fresnel Lenses, Universal Diffusers Optics, etc., moreover the optics are available differents diameter: Narrow Beam, Medium Beam, Wide Beam, Ultra Wide Beam, Super Wide Beam, Elliptical Beam, etc. 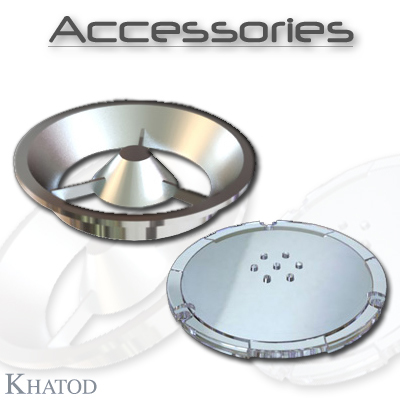 Entirely designed, developed and manufactured by Khatod. 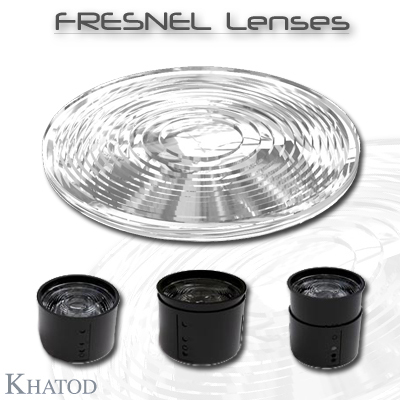 The Kristall Optics are TIR Lenses made of PC. Avaialble in 3 Beams: Narrow, Medium and Wide. Provided with special adaptors, customized for the individual models of the major HB COB LEDs. The adaptors allow for easy fi xing of onto the COB LEDs: fix the adaptor onto the PCB with two screws ot twist & lock KRISTALL onto the adaptor. 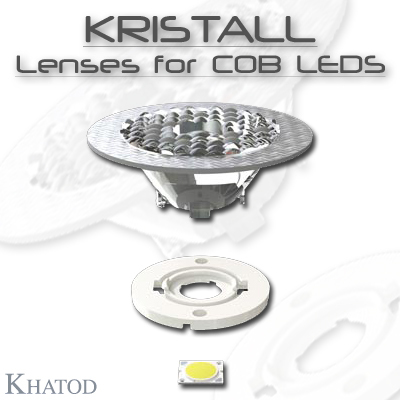 The adaptors allow for interchangeability of KRISTALL models on the same LED source. Excellent performance for a wide range of COB LEDs. 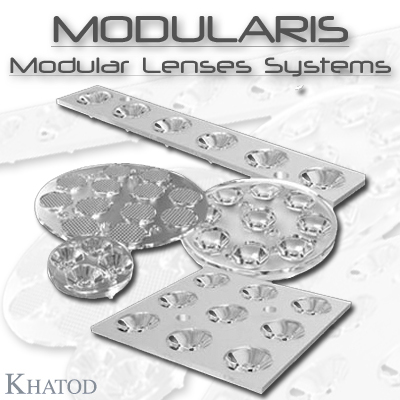 Modular Lens Systems made of holders able to accommodate diverse lenses. Holders: diverse configurations for the housing of 1 to 3-4-7-9-12-16 lenses; Lenses: narrow, medium, wide, super-wide and elliptical beams. Modularis covers virtually all kinds of General Lighting Applications. 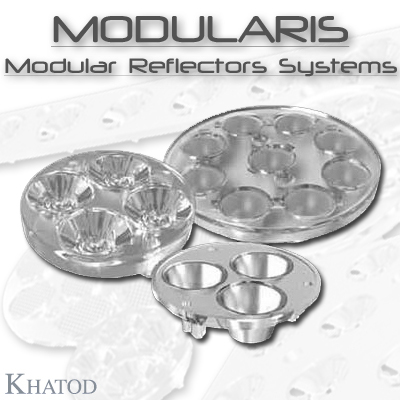 The modules - Holder+Lenses - offer a "plug-and-play” functionality whereby MODULARIS is ready for use within seconds. By positioning Khatod lenses onto the micro LEDs in Red, Green, Blue and White (RGBW) colors, a real perfect optical system providing an excellent color mixing is settled. Such optical systems are suitable for lighting items at short distance, because the light beams they produce do not transmit either UV rays or heat. They are also recommended in the specific wall-washing lighting which requires a perfect uniform light beam. 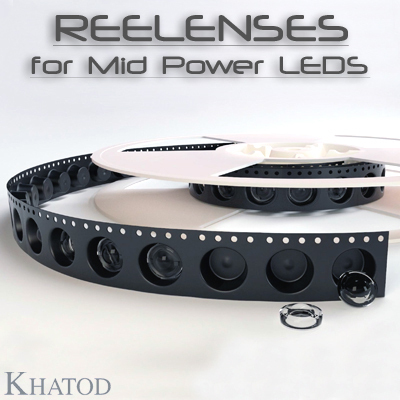 Khatod Color Mixing Lenses for RGBW Systems are specifically designed for mixing four light beams of different colors in one beam, perfect and uniform, without any chromatic dispersion. Refractive optics; special design: two off axis Fresnel lenses fixed together in one piece, through an only molding process; the lens surface is made of concentric grooves which allow reducing the mass and volume of material that is required to realize the typical curved surface of conventional lenses. a Fresnel lens performs as an imaging optic. It means that moving the light source from the on-axis focus to any intra-focal position you can get different beam apertures, from the narrowest (focus position) to the widest (lens vertex position). By using the lens in an intra-focal position you will never perceive the real image of the light source but you just see a real round beam. STRIP LENSES are designed and optimized to suit most of the SMD LEDs used to build long strips, as well as High Brightness LEDs of latest generation from the most popular LEDs references. Also, STRIP LENSES deliver excellent lighting results either with white or color LEDs. 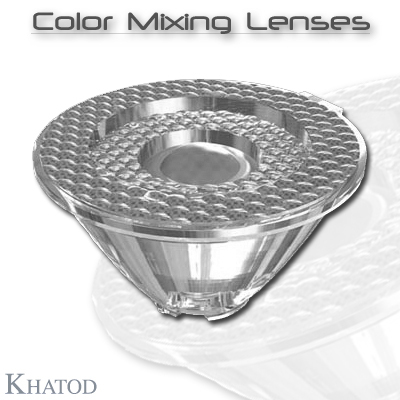 Unique on the market, Khatod STRIP LENSES are TIR Lenses manufactured through High Precision Injection Molding Process. They ARE NOT extrusion process manufactured. 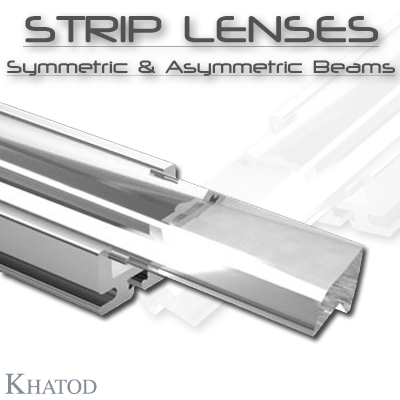 The Strips from Khatod are REAL TIR LENSES, optically engineered to perform precise symmetric and asymmetric beam angles, made of Optical Grade PMMA, and reaching a Lighting Efficiency of 89% . The lens magnifies and directs the LED light by shaping a perfect symmetric or asymmetric beam angle, depending on the Strip Lens you are using. This gives your light more focus to a direct spot in the shape you have chosen to reproduce. SYMMETRIC and ASYMMETRIC STRIP LENSES are perfect for use in General Lighting, particularly in Architectural or Decorative Light Applications. - Silicone considerably reduces the yellowing effect, so making PL50SIL perfect for the outdoor applications. No extra protection, as for example glass in case of head-pole, and no gasket for IP insulation are needed. - As an isotropic material, Silicone provides PL50SIL with high flexibility which allows an easy fit to the final application. - As an elastomer, Silicone provides a perfect compensation for the construction mechanical tolerances typical of the final application. (The light spots here represented refer to tests carried out with Seoul Semicond. Acrich2 17W LED. 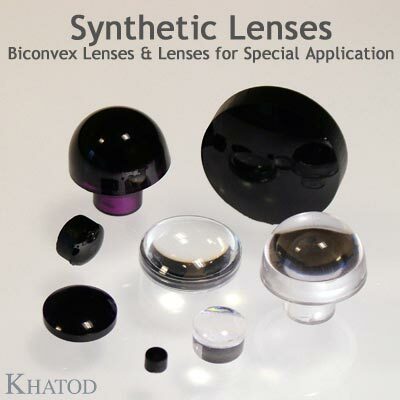 Synthetic Lenses: Biconvex lenses and lenses for special application. More than 400 models available in the catalogue with diameter from 3mm to 20mm, available in 5 different polymers (PMMA, PMMA IR, PC, PC-IR, SAN). Khatod's engineers, having worked with major European Design centers, take care of any and all details pertaining to design and development of lenses. 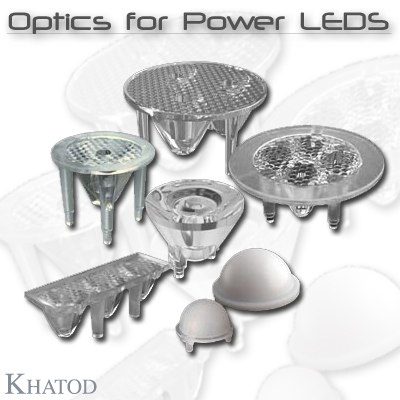 The lenses designed and manufactured by Khatod are found in many applications: industrial lasers, medical lasers, industrial and medical imaging, fiber telecommunication, scientific equipment, laboratory and industrial equipment, industrial automation and processing, professional and customer optics. 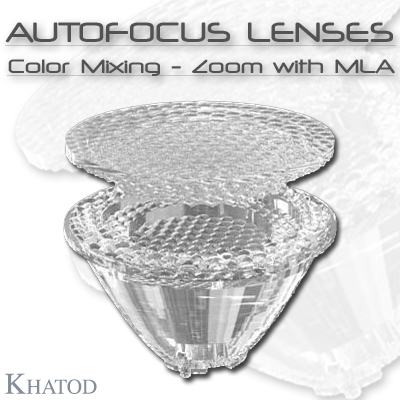 Full range of Color Mixing Optics Equipped with Moving Lenslet Array (MLA) Ø 45mm; beam angles from 11° to 45°. Can be equipped with a special MLA to be mounted on top of the lens allowing ZOOM and AUTOFOCUS applications. By sliding it on top of the lens you can vary the beam angles in a range from 11° to 45° by preserving a perfect color mixing and a high optical efficiency over 90% in the full range of the beam angles. The MLA and the lens fit perfectly as they have the same diameter. The beam angles vary from the narrow confi guration when the device is in contact with the lens, to the wider configurations when the MLA is made sliding over the lens. Secondary Optics ANTI-GLARE for Power LED created in metalized surface. 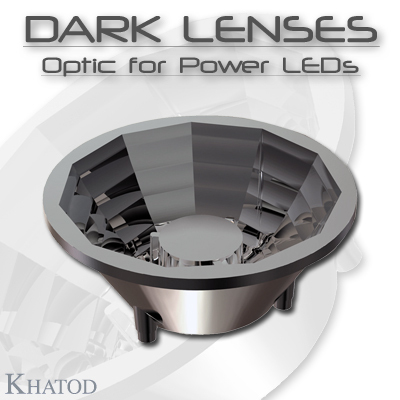 Khatod is proud to unveil DARK LENSES, once again a new-concept-product, a first-of-its-kind anti-glare reflector for any Lambertian LED with dome size up to 8mm in diameter, and recommended flux up to 300 lumens. So far, all the solutions adopted to reduce the glare have based on mechanical devices or chemical anti-glare coatings. The glare reduction was achieved, but often with a significant decrease in lighting efficiency and flux uniformity. DARK LENSES is a faceted reflector; collects the light generated by the LED’s; reflects the light in a 30° beam while assuring a perfect uniform distribution, thanks to a new high performance coating. 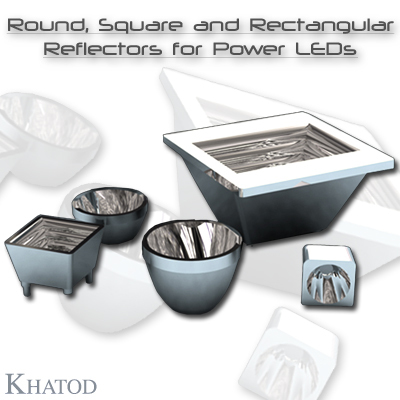 Khatod, the leading producer in the optoelectronic industry evolution, has created a new series of HEATSINKS. 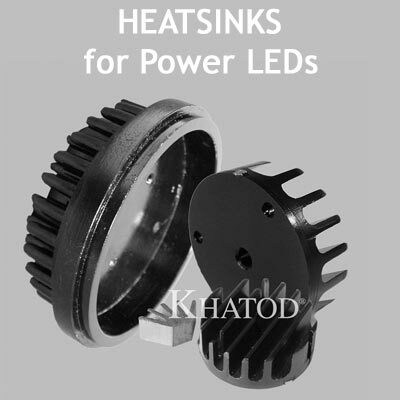 They allow an excellent dispersion of the heat produced by the Power LEDs in various applications Khatod Heatsinks, are available with all of our families of secondary optics for the major LED manufacturers. The HEATSINKS can be used both in single LED solutions or in applications complying with MR11 Standar, MR16 Standard and AR111 Standard.